Bacon in it’s most common form is cured and smoke pork belly. The Canadians, Brits and Australians do it a little weirdly, using parts of the loin too. The fat-rippled belly, however, produces a tastier and crisper finished product. Basically, I think it’s the best type of bacon. It’s not just piggies that have bellies, though. Steers have some mighty belly meat that transforms into incredibly flavorful bacon. The beef belly is better known by its industry term – navel. The navel cut is what the brisket joins into, just a little further down the body. Just like pork, it’s rippled with seams of fat that when cooked correctly transform to golden rendered ribbons. What does beef bacon taste like? The very first bite was so familiar to me… it took just a few more seconds for taste memory to kick in and then a lightbulb went off. It tastes like the fast food fries of my childhood! Why? Because back in the day, fries were cooked in beef tallow for its intense flavor. Beef bacon is pure incarnation of that flavor. Beef bacon is created in three steps – curing the belly, smoking the meat, cooking the bacon to beefy perfection. Making your own beef bacon is not difficult, it’s just a matter of being prepared for the time the cure takes, then the smoke stage. The most difficult thing may be procuring navel, or belly, but you can approach your local meat market to special order it for you or even order online. They are also quite large, so you can always make half as a batch of bacon, and freeze the second half to bacon-ize at a later time. You will also need to track down pink curing salt for the curing process. This is also known as Prague Powder #1. Fun fact – #2 is in fact for long cure items such as ham, whereas #1 is designed for a quick cure and items that will be eaten relatively soon after curing. You can find this at specialty grocers and procure it quite easily online. Finally, you may like to consider an instant read thermometer like this Thermapen to check the internal temperature of the meat during the smoking stage. And if you prefer to try your hand at original pork bacon, try this recipe. 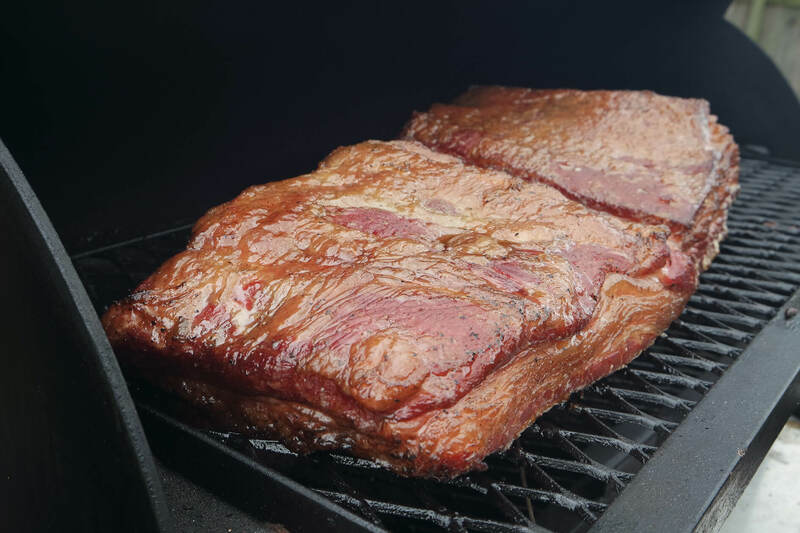 You can use any wood you prefer for the smoking stage, but beef works well with bold woods such as hickory or mesquite. CURE: Add all the dry ingredients together to create a rub mix, then rub into the surface of the beef, pressing it onto the sides to make sure it's well coated. Place the belly into a large zip top bag, making sure as much of the cure mixture as possible makes it into the bag. Place the bag into a fridge to cure for 3-5 days. Once a day, massage the liquid that accumulates in the bag and flip it over. DRY: After the curing process is complete, remove the meat from the bag, and rinse thoroughly under cold water. Pat the belly dry with paper towel. Ideally, you will now return the uncovered belly to the fridge to dry out overnight, but if you can't wait for this step it's not essential. SMOKE: Preheat a smoker to 200-215f. Place the belly into the smoker and cook until it reaches an internal temperature of 150f. Once at temperature, cool then return to fridge to allow for easy cutting. COOK: Thinly slice the bacon and cook in a medium-low heat skillet until crisp. Bacon will last up to 14 days in the fridge - simply slice off pieces as needed. Unlike pork bacon, beef bacon is best when thinly sliced.